The Graco G3 SP Pump from MotionSource is very simple to program and is a workhorse. It comes standard out of the box designed with one M12 input to work with a proximity, and includes one adjustable pump element–standard, plus room for two more. All Graco G3 SP pumps have a built-in controller to monitor cycles and dictate time between lube events with a password protected panel. Standard with a low-level indicator providing a low warning and shut-down alarm and multiple reservoir choices to choose from, the G3 SP pumps deliver the quality and value you expect from Graco and MotionSource. An on-demand lube system allows you to by pass the program when needed. Automated lubrication for your series progressive systems with the Graco G3 SP pump! The G3 SP (Series Progressive) combines the robust, proven design of Graco G-Series pumps with simple programming and valuable system feedback. The only programming requirements are number of cycles and off time between lube events. Need help with service or installation of your Graco G3 SP pump? MotionSource has a 24/7 full-service team ready to help with what you need, when you need it. Our service technicians are Graco trained and certified to help with your pump needs. If you just need technical help, give us a call 888-963-6686. All of our customer support team is Graco trained as well. 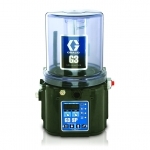 MotionSource is your Source for Graco G3 SP pumps!